Holiday Thrive: Get a Jump on It! Don't hate me for this. But I've slowly been converted to a method of tackling a project by doing a little bit everyday. And this holiday season, I'm applying that mindset to getting ready for Christmas! I want to do a little bit everyday in November so that I'm not a stressed out mess in December. I want to savor time with my family and continue taking care of myself like I have been for the past year. 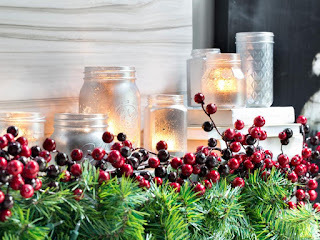 I want to enjoy creating traditions and lasting memories that are not of me running from store to store, buying last minute gifts, wrapping until midnight on Christmas Eve, and generally being exhausted. 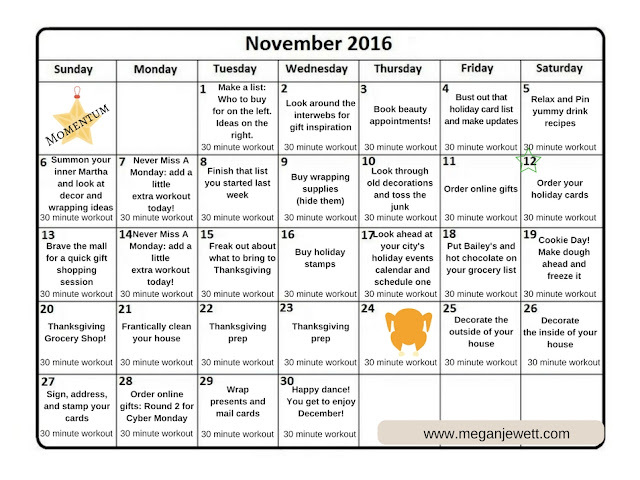 So, with that in mind, I've taken a page out of Karen's Book (err blog) and created my own Momentum November Holiday Prep calendar. I celebrate Christmas, but it's pretty applicable no matter what winter holiday you celebrate. It's also not really designed to incorporate getting prepped for Thanksgiving. Hopefully all you have to do for that is show up somewhere with a yummy dish to contribute! With that in mind, here you go! Print it off and tackle one thing each day. Don't worry if you don't end up keeping up. Or if you go out of order. The important point is: GET A JUMP ON IT. So you can THRIVE this holiday season. Oh--and those 30 minute workouts everyday? Yeah, you should do those. I can give them to you. It makes it so easy to fit in a little bit of a healthy habit for yourself if you can just get it done right in your own home in just 30 minutes. I've still got my group going on and you can jump in anytime! Contact me if you want more info. In the mean time, get busy (but just a little each day)!